As many of you will have seen on our Facebook page the Society recently acquired a "digital" stereoscopic microscope (it has a built in webcam). This is a midrange product suitable for examining artefacts and ecofacts at x10 and x30 magnification. "Extras" with the microscope include a measuring eyepiece and a mount for a Canon SLR camera. The inbuilt webcam has a 3 megapixel sensor which is adequate for reproducing images in e-mails and web pages. The video capability produces an image with low frame rate due to the low light levels diverted to the imager but it can be used for demonstration purposes. The main reason for the purchase was to facilitate examination of items recovered from soil samples much as Dot McBrien has been doing for some time. It can, however, be used by Society members for any archaeological investigation of the very small! Soil samples are routinely dry sieved on site to recover small artefacts and ecofacts. Sometimes wet sieving is used on site but more often soil samples (up to 100 litres) are removed for wet sieving and flot collection in a more controlled environment. Our Society cannot handle such large volumes due to lack of storage space and suitable equipment. However, that does not mean we cannot collect smaller samples to answer specific questions. For example, last year at Rocky Clump Brenda excavated a hearth near to a find of slag and decided to take a sample of soil for examination. After wet sieving the heavy fraction contained a much higher proportion of magnetic particles (collected with a magnet) than soil from other parts of the site. Expert analysis may reveal whether these particles are ore, microslag or even hammerscale indicating metalworking near the hearth. Questions relating to archaeological environments can be answered by examination of biological remains such as pollen, diatoms, insects, molluscs and plant parts (some often preserved as carbonised fragments). Such analyses need to be conducted by an expert environmental archaeologist in order to obtain authoritative results. However, I think that there is much to be gained for a group such as ours in conducting small scale analysis both in terms of furthering our understanding of archaeological methods and gaining an indication of what the soil samples can tell us about our sites and informing further sampling strategies. 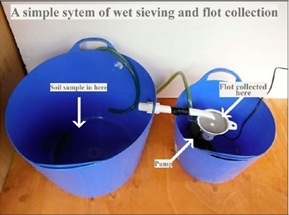 With this in mind I have constructed a simple wet sieving and flot collecting system that seems to handle small samples (1-4 litres) quite well (Fig. 1). Water is continually pumped between the small and large tubs. The sample is gently agitated in the larger tub and the flow of water carries the flot along the connecting pipe and through the 200 micron sieve mounted in a funnel. The system can be left to run with occasional agitation of the sample and checks that flot is not adhering to the sides of the tub. The resultant heavy sludge can then be poured through a 750 micron sieve to recover a heavy fraction. (If necessary the water can be collected and the fine sediment, mud, left to settle). Examples of a heavy fraction, flot and ferrous (magnetic) fraction are shown in Fig. 2.